We arrived a day early and had the chance to preview the first two stages. Our director, Bingen, loved showing us his home roads and sites along the way. It would be one of our only chances to absorb views of the peaceful, rocky coastline and lush mountains unimpeded by the physical and mental stress of racing what is known as the toughest week long climbing race on the calendar. We stopped for a snack at a bar overlooking an island where they filmed scenes for Game of Thrones. It’s that sort of fantastic setting. Gaztelugatxe, some serious Basque spelling. Photo during our stage preview. The opener kicked off without a big fight. Our Eritrean neopro, Amanuel (I won’t try to spell his last name until I can pronounce it), jumped in the breakaway. Small hilly roads stretched the peloton into a long line. We surged the approach to the penultimate climb, and the peloton shattered when the road kicked up. I wound up in a comfortable group to pass the final uncomfortable wall-like climb. It was like a sidewalk that should have had stairs. Igor and Serge finished just behind the first group. With two riders well established in the lead overall, a relentless fight for the breakaway ensued. I followed moves and attacked up and over the first climb. A rain slick technical descent split the peloton as we a approached the “carreterra de cien curves,” the road of 100 switchbacks. I sprinted out of every turn as the sizzling pace continued. Serge and Igor had missed the split and their half of the peloton chased for 70 km as I continued following moves at the front. Finally a very strong breakaway escaped on a climb. We slowed down at the front and the two main groups rejoined. The climbs into the finish were very similar to stage 1. I rode at the front to position our guys before those accents, and then churned my way over the steep pitches to the finish. Igor and Serge finished close to the leaders. Alaphillipe and Roglic placed 1st and 2nd on the stage again. With the freedom to cover big breakaway attempts, I patrolled the front. The teams and riders eager to make the escape made themselves clear. We attacked each other into the base of the first climb. Tom Slagter slipped into a promising move. I countered and six of us got a gap. Two other riders were just ahead of us and a few teams in the peloton launched riders after us. We fended them off and after the second climb they let us go. We reeled in Thomas De Gendt and my friend Chris Juuls Jensen just as we turned into a ferocious head wind. All of the riders in the break contributed pushing into the wind. Midway through the stage we hit the hardest climb. I began to suffer, but when De Gendt attacked for the KOM points, it was clear that my companions also felt the strain. 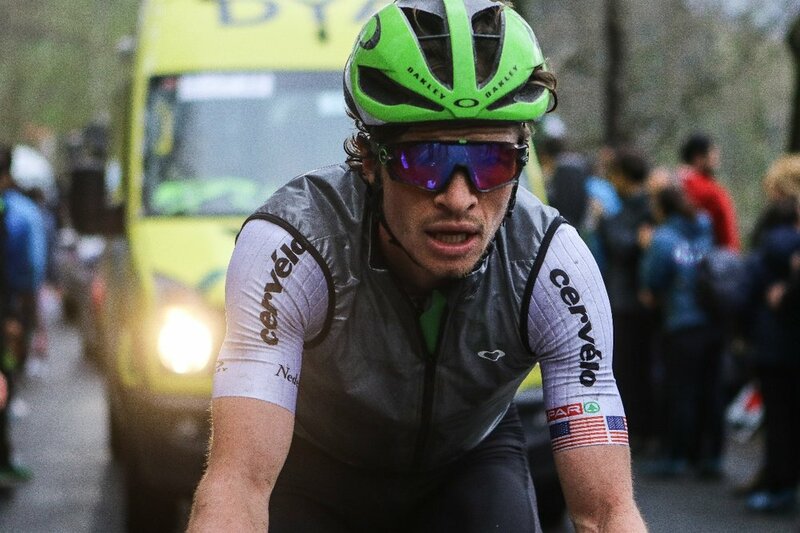 The peloton chewed into our advantage, and I was glad to hear that it would be no easy day for those sheltered in the peloton. With a one minute lead and forty km to go, De Gendt ramped up the pace. I hesitate to call it an attack, because he stayed seated and never looked back. But, I was at the back of the group and all but two riders dropped. I managed to sprint around them and connect with De Gendt, Chris JJ, and Sivakov from Team Sky. Sivakov and I skipped a few pulls, desperate to recover from the effort of closing the gap to De Gent. Apparently he didn’t want passengers because he surged again. Again I was at the back. I watched Sivakov lose the wheel. He stood up to sprint and I thought, “he’ll close it.” But he didn’t. The gap grew. I put in a huge effort rejoin the two leaders but De Gendt must have known I was coming because he stayed on the gas and I fell behind as we crested a small hill. I waited for Sivakov and we worked to survive the last real climb before the finish. We kept the duo at twenty seconds, but the peloton swallowed us up just before the top of the climb. I held on to the peloton which eventually swept up the breakaway’s remnants. My friend Jay McCarthy won the sprint. After yesterday’s effort I needed to recover, but did enough effort to keep my body activated for the final two stages. I finished somewhere around 60th. Steve Cummings was our best finisher in 15th. It looked like Roglic’s team, Lotto Jumbo, was willing to let a big break go, so despite the block headwind I jumped after a lot of attacks. As one I was in got brought back, a group of 12 countered. I made one futile attempt to sprint across a twenty second gap alone and then we turned into a crosswind. The field threatened to split and I suffered. The rest of the day I made it my mission to protect Igor and Serge. Serge stopped for a nature break before a mid race climb. I drifted behind to help bring him back, and was still at the back when we hit the climb. Team Moviestar went full gas from the bottom to try to soften and isolate their rivals. I got popped off the back and tried to appreciate the views to soften my disappointment. Sometimes you fake it to make it. With nothing to lose I attacked like a hero up the first climb, and then found myself holding on by a thread. At least I avoided a big crash. Race leader, Roglic, wasn’t so lucky, but he motored his way through groups of floundering riders. I was lucid enough to appreciate the powerful grace that propelled him back to the front. Four consecutive climbs finally spat us out in a valley. Besides the breakaway up the road, there were just thirty riders left in the peloton. I felt better about myself, but we slowed and the domestiques (worker teammates) rejoined to set the pace. I’d burned through all of my matches and fell behind in a group when the fireworks began. Only at the finish did I realise how cold and drenched I felt. Finishing a race is a combination of relief and pain. Although mental reserves may be depleted, there remains the time sensitive task of preparing body and bags for the airport without forgetting anything amid the hurried exchange of “goodbyes" and "thank yous” with staff and teammates. When my suitcase hits the living room floor and the couch swallows me, it all sinks in, but I won’t unpack, because the next one is just a few rides around the corner.